At the end of a long day where you have been on your feet massaging clients, a little self-care can help hit the reset button after closing time. You deserve it! 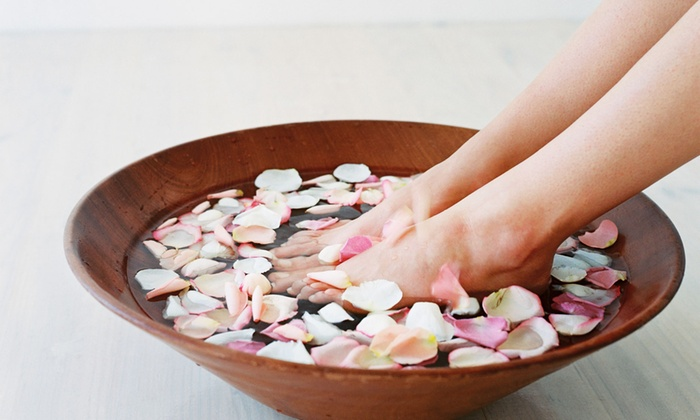 One technique we have become fond of over the years is an herbal foot bath. This simple hydrotherapy treatment definitely comforts fatigued feet and can help speed recovery from overuse, exercise, and subacute sprains & strains. The best part is, you only need a few things to get started! Place a towel on the floor in front of your comfortable chair. Fill the tub with warm water (about 100°F) while adding the Epsom salts, being sure to dissolve the salt completely. Add 5-15 drops of an essential oil like lavender or bergamot for relaxation or try peppermint or eucalyptus for pain and inflammation. Alternately, adding a cup of strong herbal tea can take the place of essential oils; chamomile or peppermint tea are perfect additions. When the plastic tub is about ¾ full, put it on the bath mat in front of your chair, slide your feet in and just relax for about 15 minutes. When your 15 minutes are up, rinse and dry your feet. Massage your favorite moisturizing lotion into your feet and then slip into some cozy socks. Viola! Do you have any favorite self-care routines? Let us know in the comments below!